The Dragon Fund, LeBow’s student-managed equity portfolio, was started in the fall of 2007 with $250,000. The fund, which specializes in U.S. midcap stocks, has since grown to more than $1.8 million (as of December 2016) due to benchmark-beating performance and additional inflows of $100,000 in March 2011 and $450,000 in June 2013 as authorized by Drexel’s Board of Trustees. 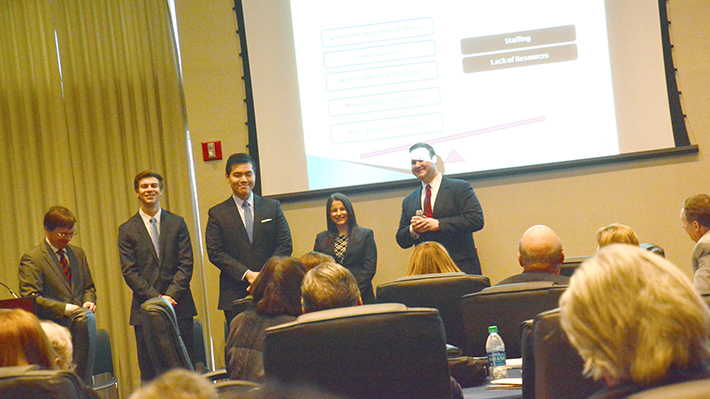 The fund is managed by LeBow undergraduates through two courses, Applied and Advanced Portfolio Management. In these courses, students team up in sector groups to apply asset allocation and stock selection models to run this real-world equity portfolio. In the process, they also acquire proficiency with financial software used by institutional investors, such as Bloomberg and FactSet, and get exposure to and feedback from senior investment professionals in collaboration with Drexel’s investment office as well as through Drexel’s alumni network. A substantial proportion of former Dragon Fund class participants have found full-time employment as financial analysts at institutions such as Bank of America/Merrill Lynch, Barclays, BlackRock, Citigroup, Glenmede, Goldman Sachs, JP Morgan, Nomura, PNC Capital Advisors, T. Rowe Price, Turner, and Vanguard. For a more detailed description of each course please refer to the course descriptions below. This course covers topics related to portfolio management. Students will learn how to analyze industries, select securities for inclusion in investment portfolios, and analyze portfolio performance. Students will participate in the management of a real investment portfolio for the duration of the course. Find out more about the Dragon Fund. This course covers advanced topics related to portfolio management. Students will learn how to analyze industries and the investment potential of individual securities in depth. They will also learn advanced methods for analyzing portfolio performance and investment strategy. Students will participate in the management of a real investment portfolio for the duration of the course. Find out more about the Dragon Fund. The finance and trading labs are equipped with cutting-edge, industry-standard software on 42 computers for student and faculty use. Learn more about the DragonFund and the application process.